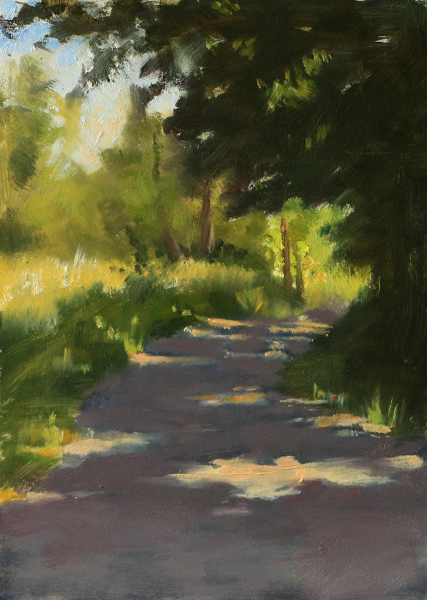 Shaded Track in Provence, oil on panel 7 x 5 inches. I was so excited when I started this. And anxious. Immediately the value problem became very obvious. How was I to translate that wide value range in the world out there to something that made sense on my little panel? And more than that, how was I to create a feeling of light in the painting? What I went for was a form of value compression called (in Harold Speed’s book The Practice and Science of Drawing) bottom up. What that means is that you start with your darkest dark – in this case the large tree shape on the right. Then you try to paint the next main value area up, trying to make the relationship the same, or close to, what you see. As you move up the value scale this way, you very quickly get to the top end, the lightest part of the scale. So a lot of your picture ends up quite light, but with a dark accent to anchor the value relationships at the bottom. I’ve played with this way of controlling values before in interior painting, but it was much harder to do in the landscape. What actually happened is that I tried for this approach, and then did a huge amount of correction and adjustment as I went along. It’s hard to describe the mix of desperation and excitement I felt whilst I wrestled with this little painting, trying to create a feeling of the strong Provence sun without going overboard. Julian gave me some great help with the composition towards the end, simplifying the shadow shapes on the road. He advised me not to have anything distracting happen in the bottom inch or so of the painting. I removed the patches of light there and immediately the focus seemed to shift towards the point where the road disappears from view. So that part of the painting became the focus. I sharpened edges there, and dropped a couple of trees on the left that were distracting. The painting became a stronger arrangement and started to make sense. One of the valuable things I learned from this first foray was that editing nature is fine – in fact it’s a good idea, if you want to create something that works as a picture. And when you’re up against changing light and time is running away from you, you need to be selective. Of course I’m used to doing that to an extent with still life, particularly flowers. But it became much more of a necessary part of the process with this painting, and with all the ones I did after this one – which I’ll be posting soon. I’m so tempted still to keep this one as some kind of memento, but I also believe that part of being a professional painter is letting even the ones that are special to you go. I’m hoping it’ll be good practice for when I have to do the same with my kids! Gorgeous painting! Looking into it’s depths, I can hear the lazy buzzing of the summer bees and the birdsong! Yes there were bees! The birds were strangely quiet much of the time though – I wonder of the heat was too much for them? Congratulations, I felt a sense of calm when looking at your work, a wish to walk down that shady path,.well done. thank you Moira! That’s lovely to hear. Very encouraging to hear you describe your process with this painting. I get Julian’s posts on his site regularly and have begun to use your online exercises ( part way through the value scale painting exercise ( day 3). I find editing difficult ( as if Im obliged to record everything in front of me) when painting outside and also the values. I’ll look at Harold Speed’s book. I did do a weekend course with Marc Dalessio ( do you know of him?) a couple of years ago and he spoke a lot about compressing values. Still working on it. Yes, I’m a big fan of Marc Dalessio, his work and his site. In fact the tube paints I chose to use were largely based on a post of his. The editing part may be the most difficult challenge for me too. That and painting quickly enough to finish a painting before the light changes too much – I’m sure the discipline will be good for me! This is beautiful… Your editing comments are most helpful for those of us who feel we must include all that we see! Inspiration to take my painting outside and simplify! You’re welcome Kathy, and thanks very much! Oh Paul!! Lovely painting!! It looks like around here, in Canada, right now. Lovely, dreamy painting. If you want to “keep it”, have a Giclee made of it, or even a coloured photocopy. We should all keep copies of our paintings in a scrap book or file. You wouldn’t believe, when you go through them after a few years, how many paintings you have actually done and you will have forgotten a lot of them. I keep high resolution .jpg of my best paintings, sell the original painting and then if I want to make a copy to frame for myself to hang, I have the high res. .jpg on my computer to take to the shop! I, of course, have asked the permission of the person to whom I’ve sold the original to, if they have a problem with doing this. I haven’t had anyone mind so far. Thanks Bronwen. Yes, I always keep hi res photos backed up on external drives. Still, I’ll miss this one when it goes I think. Of course there is Judy! Don’t forget I had a plein air master looking over my shoulder giving me advice. Plein air painting is a joy and a challenge which you will sometimes win, and sometimes lose—but you always learn as you go. This little painting is a nice success! Overall, the choice of harmonious colors and soft edges depict those found in nature. Would you mind sharing the choice of brushes used to create this little gem? Thank you. Thank you Jen! I used mostly hogs, flats and filberts, from Cornelissen. They last really well and are pretty firm. Oh, and your painting is lovely! Appears to be quite a departure, and you did it so well! Yes, very different circumstances than the ones I’m used to! Welcome to the beautiful world of plain-air painters! Lovely painting. I wish you were going to be with Julian in October. I’m so excited about painting plein-air with him. Most of my painting is watercolor and in studio. You’re exercises will give me a jump start. thanks for sharing! Very excited for you as you get outside to paint. The longer I do it, and listen to people with more experience, the more I realize that what you see out there is just a (lovely, living, diverse) structure that you can use as you arrange your values and colors. It’s like an opera–the story (sometimes a bit nutty) is just an occasion for a lot of emotion in music. In painting, the structure just gives you places to put your lights and your darks, your beautiful notes of color. So–knowing that, you can edit all you want. Get the composition down to something simple that you can handle in one session, and then, as you paint your dark and light areas, make some genuine observations about color and light. There are colors that only your eyes, and not a camera, can see, because of how our eyes work. Keeping it simple is easier said than done, but doing a small, quick value sketch, and then a small quick color sketch before you start the bigger painting really helps. Thanks for sharing what you’re learning, it’s great to follow your progress and benefit from your experiences. Thankyou Paul. This is just what I need. I’d love to know Which colours were you using with Julian? Only I need to cut down on carrying weight . Thankyou so much for sharing this. I think that was it. On my last couple of forays I’ve added raw umber – I just like the fast, low chroma yellow, it’s useful for a lot of things. I was finding I was spending a lot of time reducing chroma with the higher chroma colours and it was difficult to do reliably. Raw umber is a mainstay for me, such a useful tube colour. I use MH. I’ve also started taking out ivory black with me but haven’t used it yet. I’ve also added curulean – mostly because Marc Dalessio says it’s invaluable and he also uses lots of blues. I’m trying it out, don’ know if it will stay on the palette yet. Mostly I’m looking for a fairly wide gamut without carrying too many tubes, and a few convenience colours to make frequent mixes easier. I will try your selection and leave the rest at home. Lovely painting Paul. I want to thank you for sharing the learning process and insight into the constant struggle for painters in developing their art. I look forward to your newsletter popping into my email! Thank you Andrea, that’s great to hear! It is beautiful plein air painting. Love the composition, road disappearing from the view and the light effect.Thank you for sharing your thoughts about the correction, very helpful. Thanks Sheetu! The viewpoint was chosen by Julian (shiftinglight.com) so I can’t take any credit for that – it was a lovely spot to paint!